The Good: And So It Begins . . .
Picture it: L. June, 2013. School party with her classmates. Lots of people. Lots of noise. People she knows. 0 mg of STX-209 in her system. Notice the lack of picture below of her swinging at the piñata? That's because she didn't. Not today. All she talked about all week was the "pick-a-nic" at the park on Friday! She was so excited. I was already sitting in the pick-up line at the school when L's class was walking back from the park, ready to end their last day of school. I knew things didn't go well when I saw her walking, holding her teacher's hand with headphones on her ears. <sigh> I wonder what triggered her . . .
She goes through the school, gets her backpack, and I wait. Her aide came to my car and said L was in the nurse's office because she melted down after a mosquito bit her. They could not calm her down while at the park until they promised her she could go to the nurse when they got back to school. So, I waited. L finally comes out of the school, still holding teacher's hand, still wearing the headphones. I was informed that the park trip was not successful, but she made it through. I asked L how today was and she said, "fine". 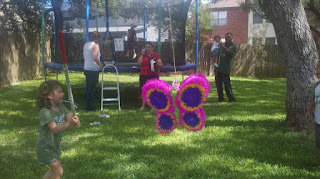 I asked if she hit the piñata and she said, "all the kids wanted to". I said, "I know. Did you get to?" Me: "why not? Too many kids? Did it break before it was your turn?" L: "NO! I COULDN'T DO IT!!!!!" My heart dropped. My baby girl was so upset that she couldn't do it. I could picture it in my head: it's her turn. She steps up to take the stick and her body freezes. Everyone's encouraging her. She throws herself on the ground and says, "I can't!" Then, she starts grunting, hitting herself, possibly biting herself because she really WANTS to do it, but she can not make her body do what her will wants. I see her teacher picking her up off the ground, walking away from everybody, and wiping her tears. I can picture L's breathing getting slower as her body starts to relax again and the anxiety attack fades. I see her finally walking back to the piñata and slowly pick up a few pieces of candy from the ground, because that's all that's left by the time she's able to move again. I had to fight back tears on the drive home. It made me remember last night when she was getting ready for bed. She took the rubber-band out of her hair and it fell. She couldn't find it and became upset. I was in the kitchen not watching too much what was going on, but her daddy was trying to console her, let her know it would be okay. I walk by them to head to another room when I saw it. L hit her daddy in the face. It was a hit of frustration, agitation. I know she didn't know what she was doing or why she was doing it, but seeing her hit him shook me. I have not seen that kind of action from my baby girl before. I know there are some who feel fighting the drug companies is not the way to go. I know that the trial drug did not "succeed" in the written goal. I also know that my child was changed. It wasn't a placebo affect. The medicine was genuine and true and gave me the daughter I know L is. Now that the medicine is out of her system, MY L is gone. It's only been 2 weeks since she titrated down. It's only been 30 hours since she took her last pill. I've already seen more meltdowns, more fits, more "I can'ts", more hitting, and more biting attempts than I saw in the last year combined. I am sad beyond belief, for her, for her sister, for their daddy. I know it will all be well in the end, but now it's MY turn to grieve. I haven't truly done so yet because I always knew there would be a way to make things better. For the time being, however, the struggles will return. We will once again have to plan for every possible scenario to help prevent meltdowns. We will once again sit as close to the exits as we can so we can make our quick getaways. We will once again have to rearrange our lives to make L as comfortable and "safe" as we can. And I'm going to have to be okay with that . . . .for now.